Do you know what materials can be composted and what cannot? 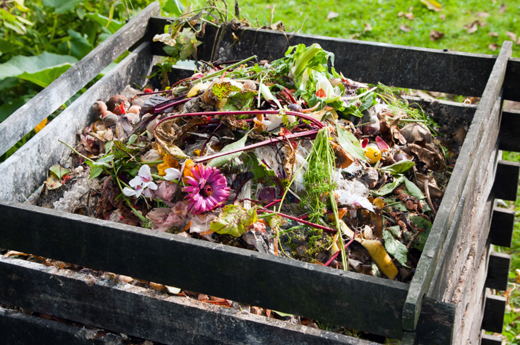 Are you looking for ways to speed up the composting process? Composting is a completely natural process that will help provide nutrients to your garden, and it’s easy! Up to 25% of household trash can be composted and kept out of landfills. Using compost also reduces the need for fertilizer and pesticides which in turn keeps these chemicals out of storm water runoff. Nitrogen- typically comes from the “green materials” in your compost such as grass clippings and kitchen scraps. Livestock manure is also rich in nitrogen. Carbon- comes from “brown materials” such as dried leaves and twigs. Water- Occasionally, you may need to water your compost pile. However, your pile should only be damp, never soggy. Cold composting is very simple and doesn’t require you to turn your pile. If you don’t have time to tend to your pile, simply piling up the materials or keeping them in a bin to decay on their own may work best for you. However, cold composting will take a longer period of time, about several months to a year. Hot composting requires more labor and produces quicker results. Your hot compost pile should be three parts green and one part brown. Smaller pieces also decay faster than larger pieces so chopping up your kitchen scraps before throwing them in could help to speed up the process. Adding some soil in the beginning will help kick start your pile into decomposing, Turning or mixing the pile every two days should produce compost in less than four weeks. Hot piles also reach temperature of 110 to 160 degrees. These high temperatures will kill most weed seeds and plant diseases. What Should Be Composted & What Shouldn’t? To learn more about composting or teach it in your classroom, visit our Pinterest board “Decomposition in Action” here! With all the advantages and benefits of composting like saving money on fertilizer, providing nutrients to garden soils, and helping the environment… Why not compost? All organic matter will eventually decompose so why not use it to your advantage? Start composting!